Tony Blair: A Dangerous Liability for All? Tony Blair: a liability in Britain and the Middle East? Disparaged by Palestinians and booed by Labour Party conference delegates, the former prime minister is losing his appeal. It has been Tony Blair’s unhappiest week since he stepped down as prime minister more than four years ago. When Ed Miliband raised his name during his Labour Party conference speech on Tuesday, it was greeted by boos in the hall – while Miliband himself, at times, seemed to come close to disowning the legacy of the man who secured Labour three consecutive election victories. And then came the bombshell, disclosed in Wednesday’s Daily Telegraph, that Mr Blair’s prized role as Middle East peace envoy is under severe threat because members of the Palestinian Authority are threatening to sever relations with him. Such a move would be a crushing blow to the former prime minister. For Mr Blair has only been able to maintain a role as a statesman – and plentiful access to current world leaders – thanks to his job as representative for the Quartet on the Middle East, charged with securing peace between Israel and the Palestinians. There were many who saw this work as essential to the salvation of Mr Blair’s reputation, so badly damaged by the Iraq invasion and its hideous aftermath. The immediate spur for the move to ditch Mr Blair comes from the belief of many senior Palestinians that he has sided openly with the Israelis over the bid by President Mahmoud Abbas for Palestinian statehood. But discontent has been simmering for many months. Last July, producer James Brabazon and I spent two weeks in Israel, the West Bank and Gaza investigating Mr Blair’s performance as envoy for a Channel Four Dispatches programme, The Wonderful World of Tony Blair, which was screened this week. We spoke to scores of Palestinians, ranging from street shopkeepers to senior politicians and businessmen, many of whom had had personal dealings with Mr Blair. Most of those we spoke to were moderates, wholly committed to the cause of peace, and reconciled to the long-term existence of Israel. Again and again we heard the same story. They liked and even admired Mr Blair. They acknowledged that he was very charming. They said that he listened. Some listed a handful of minor achievements for which he could claim a part of the credit. But there was a profound sense of disappointment. One dusty day in late July, we drove along the winding road up the hill above the edgy West Bank town of Nablus to visit the imposing, beautifully furnished and ever so slightly incongruous Palladian villa built by Munib al-Masri during the second intifada. Another businessman tells a similar story. Zakhi Kouri, who holds the Coca-Cola franchise in the West Bank capital of Ramalla, reports that Mr Blair ”always gives you a friendly response, but we are businessmen not politicians. We like to see results.’’ I asked Mr Kouri how often Mr Blair had delivered for him. ”Me personally, our business, zero,’’ came the reply. Mr Blair’s office says he raised Kouri’s concerns, but, again, they were blocked by the Israelis. Others express an angrier disappointment. Mustafa Barghouti, runner-up to Mahmoud Abbas in the 2005 presidential elections, says Mr Blair ”has failed drastically in doing his main job, which is to make the Israelis really implement what they were supposed to be implementing”. So here is the charge sheet: Tony Blair is a part-timer. His record of achievement has been limited, he fails to deliver, and is not tough enough with the Israelis. These criticisms are angrily rebutted by Mr Blair’s office, which claims a long list of achievements, ranging from help in building schools and clinics to reducing the number of West Bank checkpoints to easing import restrictions, helping with problems at border crossings, sanitation facilities in Gaza and a great deal besides. Mr Blair’s office also points to an endorsement from the Palestinian prime minister, Salam Fayyad, who is on record as praising Mr Blair for his ”full commitment to the cause’’ and for being ”extremely helpful to us in getting things to move forward’’ (though there is some evidence that Fayyad’s private view of Mr Blair’s performance may be more mixed). There are others who believe that Mr Blair is doing a reasonable job. On the last day of my visit to the Middle East, I spent an evening drinking whisky in the garden of the American Colony, the beautiful East Jerusalem hotel where Tony Blair occupied an entire floor at a cost of an estimated £1 million a year until he moved out in July. I wanted to know the truth. It is impossible not to be angry after spending time in the West Bank and Gaza, witnessing the daily humiliations of the Palestinians at checkpoints and border crossings, the attacks on Palestinian villagers by the illegal settlers, and the devastation to Palestinian businesses caused by Israeli trade controls – and I expressed my bewilderment that Mr Blair was not doing more to confront the Israeli government. My companion was a diplomat who knows the region like the back of his hand, and is very familiar with Mr Blair’s office. 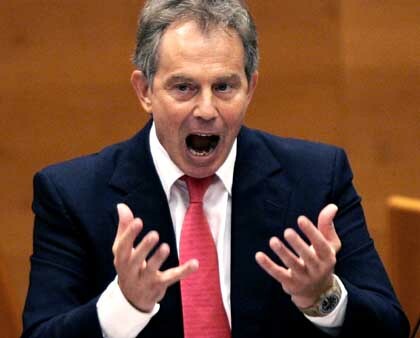 ”Certainly Tony Blair could openly challenge Netanyahu,’’ he said. ”But he would at once lose all influence. He has chosen to work from within, to push for incremental change.’’ My friend came close to suggesting that if Mr Blair rattled the cage over, say, illegal settlement building, it would be an unforgivable act of self-indulgence. This was exactly the defence put up by allies of Mr Blair at the time of the Iraq war – that by sticking close to George W Bush he could influence events in a way that would otherwise be impossible. It is a fair defence. But it carries a cost, as my companion acknowledged. Mr Blair’s failure to speak out powerfully against the worst injustices of the Israeli occupation may be a product of the best and even the most admirable of motives. But to a growing number of Palestinians it makes him look like a collaborator with what they see as an illegal regime of occupation. The row over Mahmoud Abbas’s bid for statehood has brought the situation close to breaking point, with Mr Blair held in increasing contempt in senior Palestinian circles. The prospect that Mr Blair could recover his tarnished reputation and go down in history as Saint Blair, peacemaker in the Middle East, as he so dearly desires, is receding by the day. And that may hurt Tony Blair much more sharply than those conference boos in Liverpool this week. Previous 2012 – Justice Without Borders! Next Mumtaz Qadri – Blessed Pir of Jahil Pakistani Mullahs! mulberry alexa are that loved by many people all over the world.